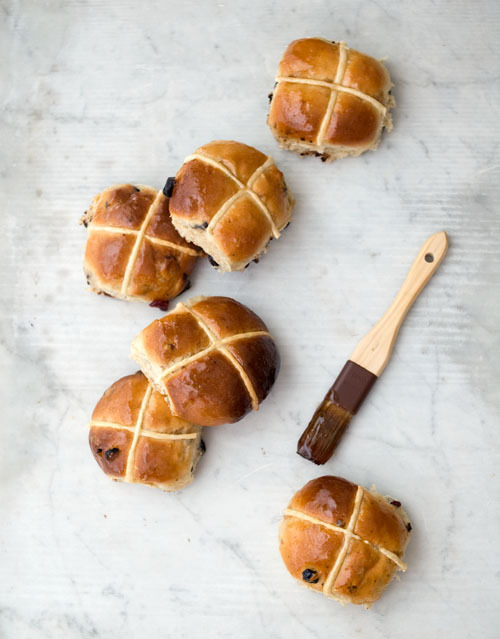 Every Easter, for quite a few years now, I’ve been trying out different hot cross bun recipes. It’s not something I intentionally set out to do, but all the same has turned into a delicious, much-anticipated annual experiment. One that rarely results in any duds and instead quite often uncovers a few gems. Since I also happen to have the luxury of time this year, I decided to try my hand at decorating Easter eggs. 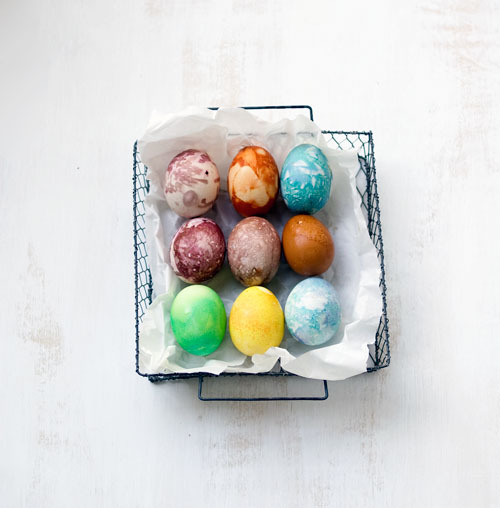 For this, a batch of eggs were dyed with food scraps (pictured above) and the remainder were covered with patterns using a neat trick as seen here. Of the two techniques, using food scraps to obtain natural dyes was the most interesting, especially for a big kid like myself. The eggs were boiled until just cooked, cooled, then left to soak for several hours in jars of various dyes. 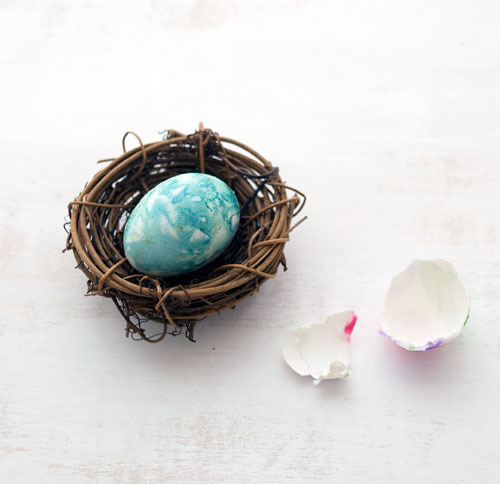 The unpredictable nature in which the colour would form and be absorbed into the shell meant that the pattern on every egg you scooped out of the dye bath, was always a surprise. So far the best colours have been extracted from the use of boiled onion skins (orange brown), red cabbage leaves (shades of blue and purple) and turmeric (bright yellow). Once you’re done admiring them though, you’re then left with the task of eating eggs for the remainder of the week – an idea rendered somewhat more palatable by having started with good quality, organic, free-range eggs, and the fact that the eggs weren’t boiled to the point of dry and greying yolks. We had yellow tinted eggs with a noodle salad for dinner last night. Very delicious. But back to the buns. This year I’ve tried a recipe using an Asian bread baking method that incorporates a water roux also known as Tangzhong, into the dough. The roux supposedly helps retain moisture in the dough, resulting in a fluffy baked product that also doesn’t dry out as quickly. Two dozen very consistent, great tasting batches later and I think this just might be the recipe that puts an end to my hot cross bun baking experiments for good. Of course, if there was some way to logically incorporate boiled eggs and baked buns into more of our meals, you’d probably find me still experimenting for many years to come. First make the roux. Whisk the flour and water together in a small pan over medium heat. Cook, whisking at all times, until the mixture thickens. If you’re unsure as to what this is supposed to look like, you can also test the temperature of the thickened mix. It should have reached 65’C. Once it has thickened, scrape the roux into the bowl of your mixer (it should weigh 120g). Place some cling film over the surface of the roux and allow it to cool to room temperature. When the roux has cooled down, add the egg, milk and sugar to the bowl, followed by the yeast, flour, salt and spices. With the dough hook attached, start mixing the dough until it comes together and looks smooth, about 2 minutes. Add the butter and continue mixing on medium speed for another 2-3 minutes. Mix in the dried fruit and chopped chocolate, then cover the bowl and leave the dough to prove for an hour or until doubled. Once doubled, divide the dough into 12 pieces (12 x 65g). Roll into balls and arrange them roughly 1.5 inches apart on a lined tray. Cover lightly with greased cling film and allow to prove again for another hour. Meanwhile, make your flour paste (see note below), place it into a piping bag and set aside. 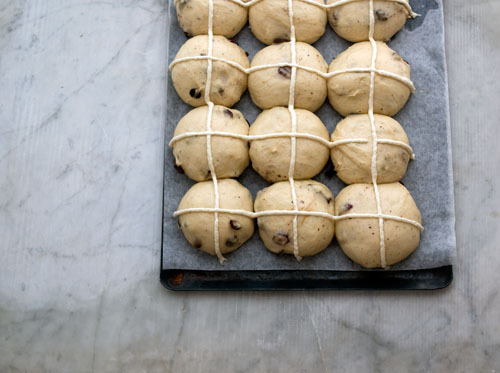 Once the buns have proved, pipe the crosses on the buns and bake them in a preheated 190’C oven for 14 minutes. When they are ready, they should be golden brown and sound hollow when tapped. Remove them from the oven and brush with a glaze of your choice while they are still warm. So last week I decided to give up sugar for a week. Initially my plan was to go sugar-free for two months, but The Boyfriend rolled his eyes and suggested I first try it for a week before launching into any unrealistic, grandiose statements. He was right of course. He knows me too well! In case you’re wondering how it went, well it’s not easy coming to any healthful conclusions after only being sugar-free for a mere week (the primary instigator for this little experiment was a few articles I read recently about why we should eat less sugar). I have however learned a few things, mostly about myself. Firstly, that I love fruit. Despite expecting cravings for cake and chocolate during my sugar-free week, it was actually fruit that I missed the most. After one week (or six days, if we need to get all technical and judge-y) I panicked at the thought of missing out on the trailing end of what has been a great stone fruit season. The first piece of fruit I bought and ate, albeit a slightly underripe white nectarine, tasted absolutely heavenly. Secondly, food tastes especially good when it has that balance between all the elements we associate with flavour; a little bit salty, a little bit sweet, or bitter, or sour. Which explains why nuoc cham and teriyaki are some of my favourite sauces. It also explains why I’m unexcited at the thought of continuing this experiment for another week, let alone two months. 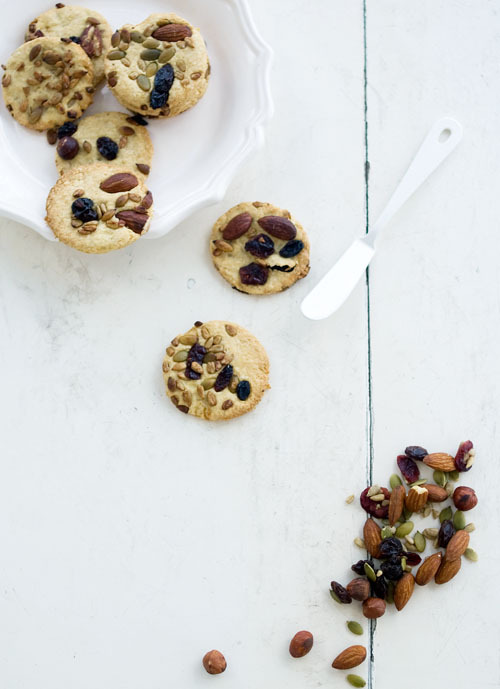 Not too long ago, I happened to make these not-very-sweet oatcakes topped with some trail mix. They were the perfect segue into my sugar-free week. Place all the dry ingredients (except for the trail-mix) in a bowl. Rub in the butter, then add enough water to form a soft dough. Roll the dough out on a floured surface to roughly 5mm thick. Sprinkle the trail-mix over the dough and lightly press to ensure they adhere. Use a pastry cutter (size of cutter is up to you; I used a 5cm diameter one here) to cut round circles of dough. Scraps of dough can be rolled again and cut. Arrange the cut circles on a lined baking tray and bake in a preheated 190’C oven for 10-15 minutes. The oatcakes will be lightly golden and tender. Tip : You can decrease or omit the sugar in this recipe for a more savoury oatcake to enjoy with cheese or as a platform on which to build a quick snack – maybe sliced avocado with sprouts and herbed yoghurt cheese! I call it “strategic grocery shopping”. This evening I’ll be doing all the grocery shopping I need to get us through Christmas and Boxing Day. It’s the thing I usually leave until the 24th to accomplish. In the past, I’ve found that shopping on the eve inevitably requires monumental patience to battle through crowds of other last minute shoppers; some even pushing two grocery carts at once, blocking the aisles while they try to decide between 1 kg or 2 kg of prawns. Cooked or uncooked. Or maybe the lobster. Or both. All I can hope for is that everyone else hasn’t decided to shop strategically this year either. 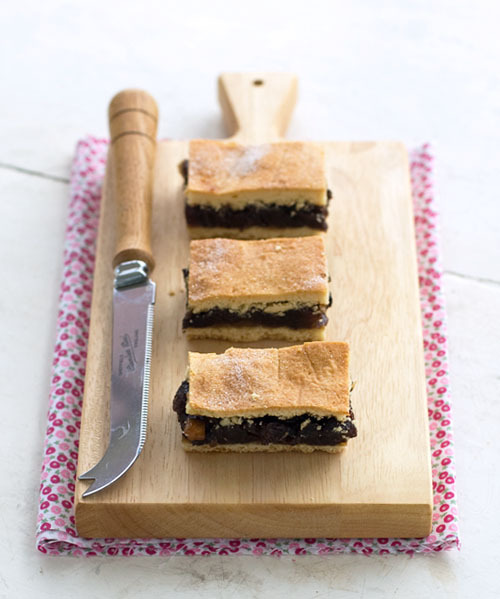 Meanwhile I have some fruit mince bars to keep the energy up. Why bars? Well, sometimes I just can’t be bothered with all that latticed pie or mini tart palaver. 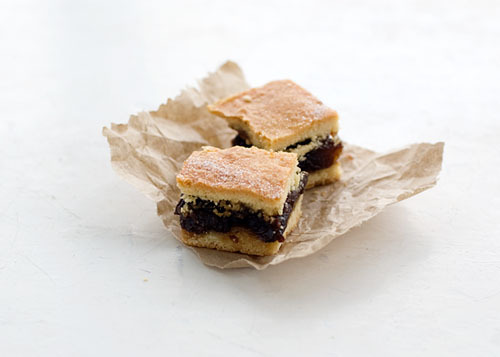 All you need is two bits of lovely shortcrust pastry or shortbread dough, sandwiching your favourite fruit mince then in the oven for 20-25 minutes. Done.